The fire piston (also known as a fire syringe or slam rod fire starter) is a tool for fire making that has prehistoric origins. This effective tool was made and used by a variety of cultures throughout the Southwest Pacific archipelagos. It is still in use today and made popular as a wilderness tool because of its effectiveness and portability. 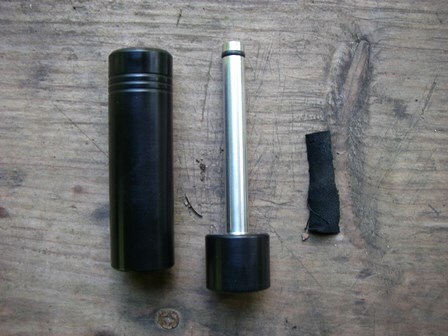 The fire syringe has 3 main parts to it: the piston, the cylinder and tinder. The piston must be fitted perfectly to the inside of the cylinder so as to maximize compression pressure. Often, the piston is lubricated with some kind of oil to help it slide more smoothly within the cylinder as well as to reduce friction. 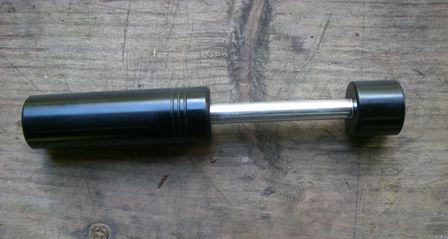 The tinder is place in the cupped, bottom end of the piston. This tinder is generally some very fine material, especially material with a low combustion temperature such as char cloth. Modern fire pistons are often made out of aluminum. Historically they were made with bamboo, horn, wood or antlers. 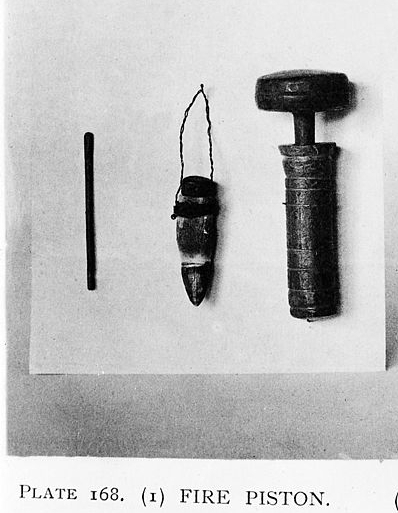 Pictured in the photo above is a historic fire piston. The piston works on the principle that when a gas is compressed, it increases that gas's temperature and pressure. The piston is forcefully slammed into the cylinder to create this compression. The heat caused by the compression is transferred to a tinder material, igniting it. Rapidly, the piston is withdrawn so that the little coal can receive oxygen in order to continue to burn. This tiny coal is then blown on and added to a much large bundle of tinder material. Finally, that bundle is blown into a flame. Hopefully, at this point you already have made a good fire structure to stick this flaming ball of tinder into and can sit back and watch it burn. This photo shows the tiny coal produced, immediately after ignition. The principle behind the fire piston is simple, but sometimes in practice there can be certain challenges. Most of these challenges have to do with improper use of this fire-making tool. Here are a few especially useful tips to keep in mind as you practice. First, because of the need for compression force, the piston and cylinder must be perfectly matched so that air and heat energy do not escape. Add a very thin coat of oil to the piston if it is not working smoothly. Second, it is vital to withdraw the piston immediately after plunging it into the cylinder, so as to let the coal be fed by oxygen. If it is left there for more than a split second, it will likely be extinguished due to lack of air. Third, be especially careful with the tinder material. Make sure it is seated in the end of the piston, with just a little bit of it protruding. 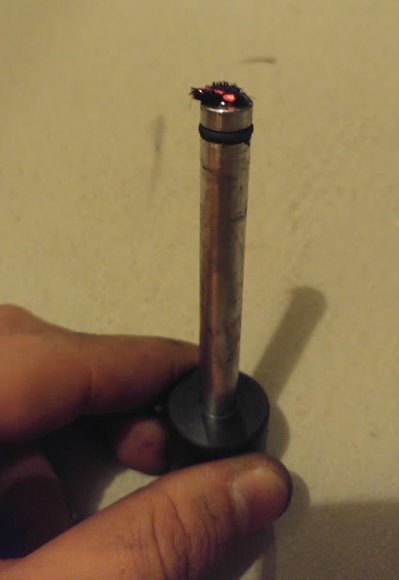 Also, be sure that when you withdraw the piston, the tinder also is withdrawn even if it does not ignite. If the material gets stuck inside the cylinder, it will stop working until properly cleared out. Whenever possible, keep your fire piston and tinder in waterproof containers such as dry bags or ziplock bags. This will keep everything you need contained, organized, and dry for when you need it. If you want to make your own char cloth, it is simple to do. Char cloth can be made by cutting up an old pair of cotton jeans or t-shirt, and burning it inside of an old Altoids container. Make sure the container has a small hole punctured in it so that as the materials char, it burns away all the oxygen inside. This will allow the cotton to char in a manner that makes it especially susceptible to combustion. As with nearly all survival skills, this one requires practice. Try out your fire piston using different kinds of tinder. Also try using it to make fire under different conditions, including on sunny days, and windy and rainy ones. The more proficient you get with this handy tool, the more you know you can count on it when it really matters. For purchasing a fire piston, we recommend Wilderness Solutions. 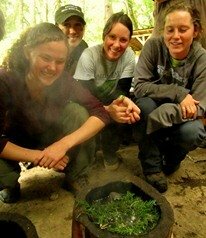 Learn about survival fire starting at our Wilderness Survival Courses.